A. A road in Florida. The road looks relatively desolate, perhaps rural, with only a few scraggly palm trees and telephone poles visible on the otherwise barren horizon. A. In or near Tampa, Florida. A. In Episode 3 ("Optics"), at 17:03. It's a short scene, and we can tell from the rectangular format that it is taking place in 2018. 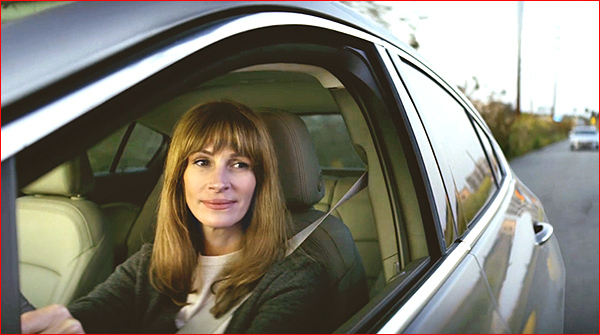 We see Heidi ( Julia Roberts ) driving home in her car from the Homecoming facility, heading to her condo, following a counseling session with Walter Cruz ( Stephan James ). It's another bleak commute home for the workaholic Heidi. Heidi seems lost in thought. At first, she looks sullen and depressed, but then a light smile crosses her face, as she thinks about Walter's road trip, and how happy he seemed to be simply driving across the country. On a whim, she rolls down the window, and briefly allows the breeze to strike her face, perhaps enjoying visualizing the idea of taking such a road trip herself. A. A street, but not in Florida. A. 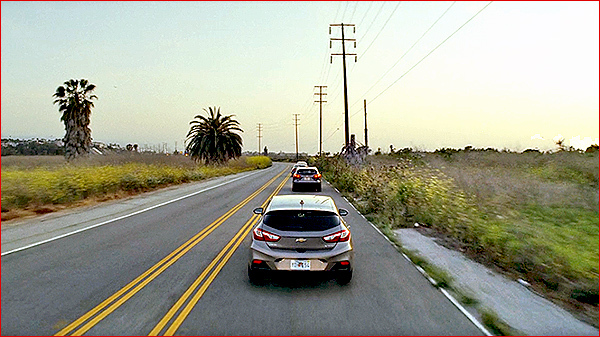 This driving scene was shot on Culver Boulevard in Playa Del Rey, California, with Julia heading southwest on Culver Boulevard. The road passes through the Ballona Wetlands Ecological Reserve, which explains the surprising lack of development ( a rare sight in L.A., where the high price of land means that every parcel is valuable, especially on the West Side, near the beach ). And as a result, it's hard to get exact street number addresses on this stretch of road. But you can see a perfectly-matching Google Street view here. Heidi is about half a mile southwest of the bridge spanning Ballona Creek, and about a third of a mile northeast of the fork with Jefferson Boulevard. This stretch of road is just east/southeast of Marina del Rey, and less than a mile southwest of the Marina Del Rey (90) Freeway. 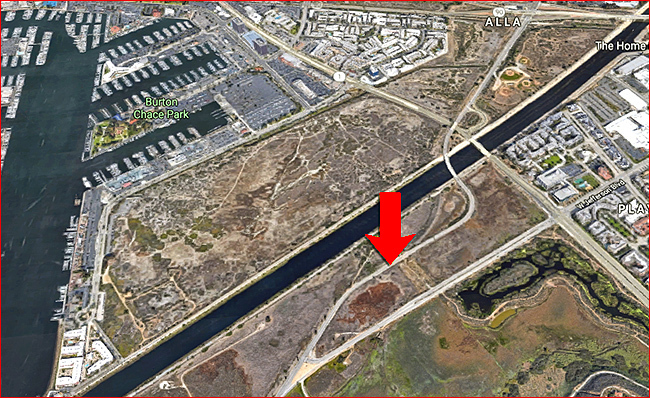 At the moment, this wetlands area of Playa Del Rey is still a relatively undeveloped patch of Los Angeles, with significant stretches of open land. But there has been a constant battle over the land between developers and preservationists. The adjacent Playa Vista area (to the east) seems to be rapidly turning into a miniature Silicon Valley of sorts, with companies like Electronic Arts, Microsoft, Facebook, and YouTube, joining Google, which owns the old Howard Hughes' Spruce Goose hangers. A. There's one thing about Hollywood that makes my job a little easier: they tend to use the same areas over and over. Location scouts know a good thing when they find it, and this Balonna area of Playa Del Rey offers two obvious advantages: traffic is relatively light here ( making it more convenient to shut down the street for filming ), and it is one of the few stretches of road remaining in the Los Angeles area that can be made to look like open, rural land. The streets in this part of Playa Del Rey have been used more than once in recent productions, including an episode of "Dexter" where it played a road in the Everglades, so it's fairly easy for me to recognize the general look of this wetlands area. It's then just a matter of pinpointing the exact spot on the road, and that's where Google StreetView comes in.